This HTML e-text of John Donne's "Epigrams" was created in November 2000 by Anniina Jokinen of Luminarium. The unaltered text is from The Muses' Library edition, edited by E. K. Chambers, 1896. Chambers' text is based on the 1633, 1635, 1650 and 1669 editions of Donne's Poems the current editor has omitted the variorum and notes, for which the reader is encouraged to see the source text, or any of the excellent modern works on the subject. Donne, John. "Epigrams." 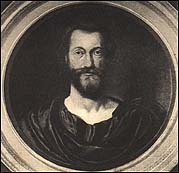 Poems of John Donne. Vol II. E. K. Chambers, Editor. London: Lawrence & Bullen, 1896. 210-. This edition is made available to the public for nonprofit purposes only. It is not represented by the publisher as a scholarly edition in the peer-reviewed sense. Unique site content is copyright ©2000 Anniina Jokinen. This e-text may not be reproduced or published in any form without express written consent from the copyright holder. For corrections, comments, and queries, please email the publisher. Both whom one fire had burnt, one water drown'd. Slain, cruel friends, by parting have join'd here. So dry, that I am now mine own sad tomb. That had a town for tomb, his bones to hide. To stand, or move ; if he say true, he lies. For, as thy sins increase, thy hairs do fall. Gave to the poor ; thou hast good title still. Only in this, that you both painted be. To be understood ; when will he be believed? In bawdy house, that he dares not go home. As Katherine, for the court's sake, put down stews. I should have had more faith, if thou hadst less. Mercury in stealing, but liest like a Greek. Ralphius is sick, the broker keeps his bed. ©1999-2000 Anniina Jokinen. All Rights Reserved.